Engineered to meet the demands of the toughest material-handling applications, Flexco® Bolt Solid Plate Fasteners provide a strong, sift-free splice with superior holding ability. Their strength derives from a combination of top-and-bottom plate compression and high-tensile-strength bolts. 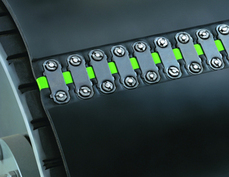 Specially formed teeth penetrate belt carcass, without damaging fibres of the belt carcus. 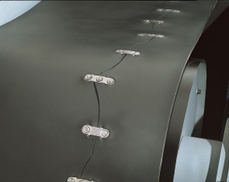 Flexco-Lok® Tape is a rigid nylon tape that helps eliminate belt ripple on plied or solid-woven belting, so belts run smoothly over pulleys and under cleaners. 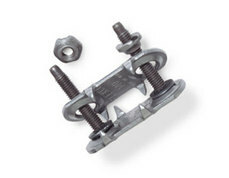 Used with Flexco® Bolt Hinged and Flexco® Bolt Solid Plate Fasteners. Also helps seal the splice against seepage of fines and moisture. Ordering numbers are FL7C (7/16" tape width) and FL11C (11/16" tape width). Tape comes 100' per carton. Templates for Bolt Solid Plate fastener installation are required for 90° and 45° splice applications. Templates are essential for installation and provide an accurate guide for precise placement of bolt holes. Lengths for all standard belt widths are available. Belt Punches or Boring Bits are used to punch holes through the belt. A punch is preferred for general use where belt cover is over 3/16" (5mm) thick. The use of a "Quick Change Chuck" on a 1/2" Drive Impact Wrench (Air or Electric) allows the power punch and power wrench to be used, speeding up the installation process and resulting in a tighter more compressed joint.